Home > Special Offers > Sales > Autobahn for All Sales Event: Extended! Autobahn for All Sales Event: Extended! Our Autobahn for All Sales Event has been EXTENDED! You won't want to miss fantastic offers on our most popular Volkswagen models, including the Jetta and Tiguan. Plus, drive away with $0 Down Payment,* $0 Security Deposit* and $0 First Payment* on select models! Spring is the season of adventure! Wherever you're headed, consider taking the fully-equipped and stylish Tiguan with you. 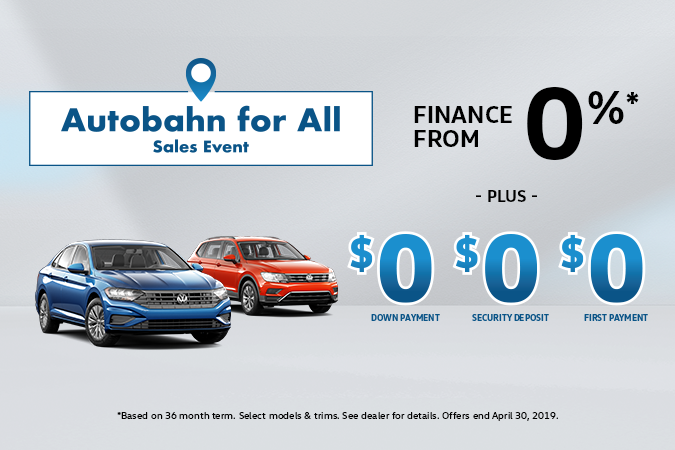 Finance the 2019 Tiguan from 3.99% for 60 months* during our Autobahn for All Sales Event! Travel with ease; this SUVW comes equipped with 57% more cargo room than the previous model, plus available third-row seating, available 4MOTION all-wheel drive and standard App-Connect. Choose from over 60 in-stock models! Luxurious in every way, finance the 2019 Jetta from 0.99% for 60 months* during our Autobahn for All Sales Event! Totally redesigned from the inside-out, the Volkswagen Jetta comes equipped with standard LED headlights & tail lights, available Rail 2 Rail power sunroof, available Digital Cockpit, available ambient interior lighting and standard App-Connect. Make your choice from 30 in-stock models! Hurry in before these Autobahn for All Sales Event offers are gone! Click below to shop online or visit us in-store at 3450 Sheppard Ave. E., in Scarborough. See you soon! *HST & Licensing extra. Select models & trims. See dealer for details. Offers end April 30, 2019.